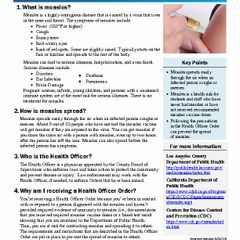 UCLA neurologist Dr. Dawn Eliashiv discusses responsive neurostimulation therapy with patient Sharon Shafer. More than 20 new anti-seizure drugs have been introduced in recent decades — a number that means little to people with drug-resistant epilepsy. For them, treatment has not improved. Some people are willing to try medication after medication — coping with side effects and getting no relief from seizures — because they believe, as do their doctors, that maybe the next drug will work. Others have been afraid of procedures that could ease their seizures, or have believed wrongly that surgery is their only other option. Still others don’t actually have epilepsy at all, but don’t know it. In fact, 30 to 40 percent of people with epilepsy — over 1 million Americans — continue to experience seizures despite taking medication. Experts at the UCLA Seizure Disorder Center at UCLA Health want to change that picture. Their message to people with epilepsy as well as their doctors is simple: Referral to a full-service epilepsy center can help. 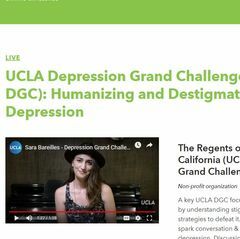 “So many lives could be improved, if people only knew all of their treatment options,” said Dr. S. Thomas Carmichael, chair of the neurology department at the David Geffen School of Medicine at UCLA. Nationally, experts agree that patients should seek other opinions. If an epilepsy patient is not seizure-free after one year of treatment, or after two medications have failed, he or she should seek out an epilepsy specialist or an epilepsy center, the Epilepsy Foundation recommends. 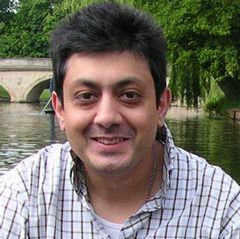 Carmichael added that evaluation by a team of diverse epilepsy specialists provides the best opportunity to avoid irreversible psychological and social problems, a lifetime of disability and premature death. Even later referral can reduce seizures and improve quality of life. “The key is multidisciplinary collaboration among neurologists, clinical neurophysiologists, psychologists, psychiatrists, neuroradiologists, neurosurgeons, social workers, counselors and specialized nurses, all focusing in different ways on one goal — helping people who suffer from seizures,” said Dr. Linda Liau, chair of the neurosurgery department. 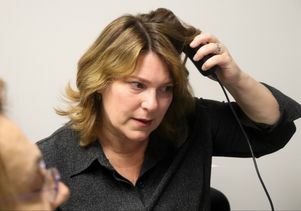 Sharon Shafer uses a wand to download information about electrical activity in her brain recorded by the responsive neurostimulation device. Just ask Sharon Shafer. The 51-year-old research librarian tried 12 medications over 14 years, without success. She once had a seizure driving her daughters to get ice cream; one of the girls managed to steer the car to safety. After a co-worker witnessed Shafer having a seizure at work, that person persuaded her to see specialists at UCLA. “My denial was so strong, I would never say, ‘I have epilepsy,’” Shafer said. At UCLA, Shafer learned that her seizures were far more frequent than she realized. As doctors explored the origin of her seizures, they discovered that they came from both sides of her brain, in areas that control language. This meant that surgery to remove tissue responsible for abnormal electrical activity was not an option. Instead, her doctors recommended a new technology in which a small device, implanted just under the scalp in the skull, senses oncoming seizures and stops them with a brief electrical pulse. Responsive neurostimulation, or RNS, is the first “smart” therapy for epilepsy, said Dr. Itzhak Fried, a professor of neurosurgery and co-director of the UCLA Seizure Disorder Center. Calibrated to respond to electrical activity in each patient’s brain, the device grows more effective over time. UCLA neurosurgeon Dr. Itzhak Fried points out abnormal brain tissue causing Sharon Shafer's seizures. At UCLA, 34 people have received the responsive neurostimulation device since it was approved by the FDA in 2014. On average, they’ve experienced a 70 percent reduction in seizures, with some people dubbed “super responders” while others still need medication to enhance the device. Responsive neurostimulation is only one option available to people with drug-resistant seizure disorders. Some people simply need an expert to tweak their medication or dosage to achieve better seizure control. Others see improvement with minimally invasive procedures such as removing the abnormal brain tissue with a heated laser to stop seizures. Experimental drugs, nerve stimulation, behavioral therapy, lifestyle changes and diet are other approaches that can help stop seizures when standard drugs don’t work. Some patients are found to not have epilepsy at all. Instead, they suffer from treatable conditions that are misdiagnosed as epilepsy, such as “psychogenic seizures,” which reflect past psychological trauma. 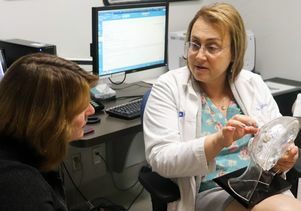 At UCLA and other such centers, specialized care also includes the psychosocial support vital to people with epilepsy and seizure disorders. The inability to drive a car or hold down a job can take a toll, leaving people vulnerable to depression and suicidal thoughts. 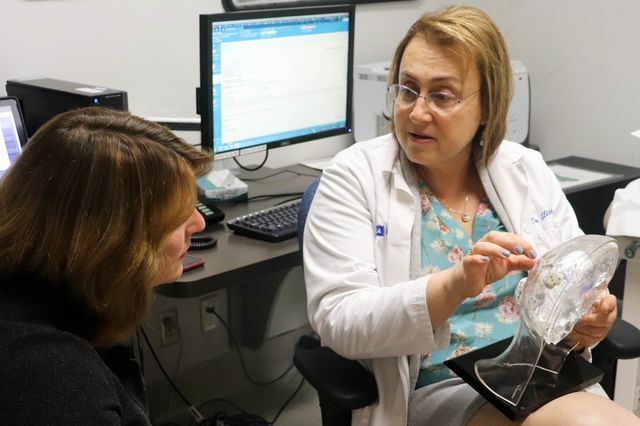 UCLA neurologist Dawn Eliashiv discusses RNS therapy with patient Sharon Shafer. 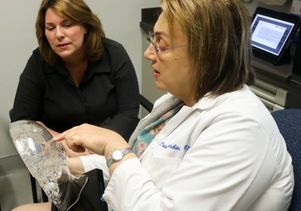 UCLA neurologist Dawn Eliashiv discusses responsive neurostimulation therapy with patient Sharon Shafer. 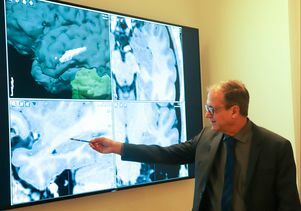 UCLA neurosurgeon Dr. Itzhak Fried points out the abnormal brain tissue causing Sharon Shafer's seizures. 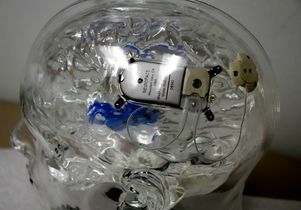 The RNS device is implanted in the skull, just below the scalp. Dr. 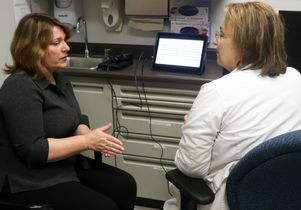 Dawn Eliashiv, right, discusses RNS therapy with patient Sharon Shafer. Dr. Dawn Eliashiv, right, discusses responsive neurostimulation therapy with patient Sharon Shafer.